Victoria is by far the most popular plum variety in the UK, dating from the Victorian era, and well-known for heavy crops of very attractive plum-coloured fruit. Victoria really excels as a culinary plum. It cooks to a distinctive pink/orange puree which makes a very good jam and a good-flavoured filling for pies and crumbles. The stone is semi-clinging, and fairly easy to remove from the flesh. The flavour has a good sweet/sharp balance, and there is often a note of almond in the background which is a characteristic of Victoria. 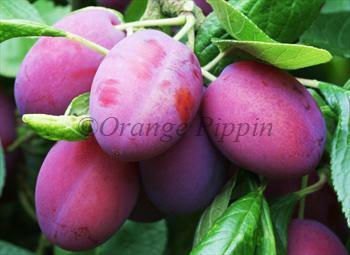 Victoria plums are sometimes considered inferior to other dessert plum varieties for eating fresh. However this assumption is probably based on the poor flavour of shop-bought Victoria plums, which are usually picked far too early. The plums will ripen over a period of several weeks and if you want to eat them rather than cook with them, leave the plums on the tree until they are fully ripe - the skins will start to become a darker red /purple (as in our photograph) rather than the more usual orange flushed colour. At this point the flavour will certainly not disappoint. This combination of excellent culinary qualities along with good flavour for eating fresh makes Victoria one of the most versatile plum varieties for the UK grower. You will get the quickest results with a Medium size 2-year bare-root bush-trained tree on the VVA1 rootstock, provided you don't mind planting between November-January. If you are giving a Victoria plum tree as a gift the Medium size bush-trained tree on the VVA1 rootstock in a 12L pot is the best choice. If you want to train a Victoria plum tree as a fan against a fence or wall, choose the 1-year bare-root tree on St. Julien or Wavit rootstocks (the extra vigour over the VVA1 is useful in this situation). 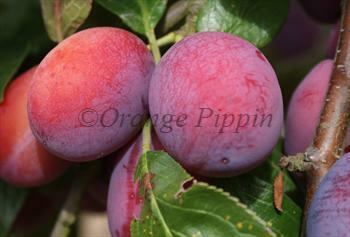 Don't hestitate to call or email us if you want further advice about choosing a Victoria plum tree. Please fill in the details below and we will let you know when Victoria plum trees are back in stock. A better flavour for eating fresh than Victoria, not quite as good for cooking. An excellent modern alternative to Victoria. Victoria is in flowering group 3. Victoria is self-fertile and does not need a pollination partner, although fruiting may be improved if there is a compatible tree of a different variety nearby. Since it flowers in the middle of the blossom season it can be pollinated by most other plum trees. Victoria is easy to grow but there are a couple of problems to look out for. Firstly it is susceptible to silver leaf and bacterial canker, the two classic plum diseases. Bacterial canker is more prevalent in the wetter climates of the western UK, and is less of an issue elsewhere. Silverleaf is a fungal disease and trees are most at risk in winter, so for this reason never prune a Victoria plum (or any plum variety) in winter, always wait until early summer - or preferably try to avoid pruning altogether. In practice, Victoria plum trees usually grow enthusiastically and tend to shrug off most problems. Victoria has a wide climate range and provided you can give it a sheltered spot will grow successfully as far north as Aberdeen, as well as on the south coast. It grows well in the dry climate of the east of England, but should also be productive in the mild damp climate of the west of the UK. It is popular on the Continent, being relatively cold-hardy and able to cope with cold Continental winters, as well as hot Mediterranean summers. Victoria produces a lot of pollen and is a useful pollinator of other mid-season flowering plum varieties. The blossom is also more frost-resistant than that of many other plums. Left un-trained, most plum trees will grow into a standard tree-shape - but this is not the best structure for supporting the heavy crops which Victoria is capable of. A Victoria plum with a branch broken under the weight of fruit is an all too-common sight - and of course broken branches are ideal entry points for the fungal diseases to which Victoria is susceptible. This problem can be avoided by encouraging the young tree to grow as a shorter-stemmed bush with wide-spreading branches and the central leader retained, or supported as a fan on a wall. Thinning the fruitlets during May will also help, and the remaining plums will be larger and have a more concentrated flavour. Even if you thin the fruitlets Victoria is invariably a very heavy-cropping tree, in fact probably the heaviest-cropping of all European plums. In a trial carried out by FAST (who run the UK National Fruit Collections) in 2011, Victoria plum trees yielded almost a third more in weight of fruit than the nearest rival, the excellent modern variety Haganta. Victoria was found growing in a garden in Sussex, in the early 1800s, and introduced for sale in the 1840s by Denyer, a nurseryman from Brixton in south London. Its parentage is unfortunately not known.